Can the Dutch rail network run on wind? Julian Turner, writing in Railway-technology.com, reported that the Dutch rail network will run entirely on renewable wind energy by 2018. This development comes from a new contract signed by power company Eneco and VIVENS, an energy procurement cooperative. VIVENS is a joint venture comprising Netherlands Railways (NS), Veolia, Arriva, Connexxion and rail freight firms. Eneco will supply 1.4TWh of electricity for the rail system . Here’s another Dutch express…the new women’s world 200 metres champion. 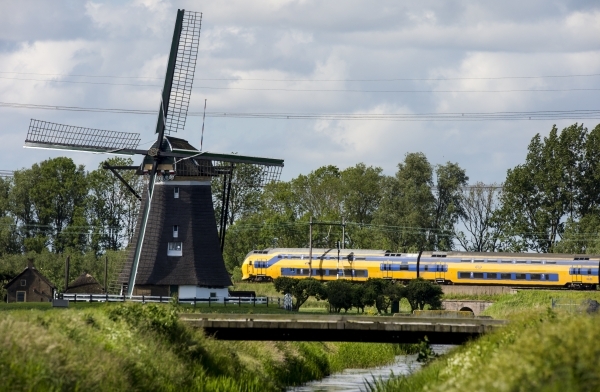 That would be a first since 75 years, dutch trains running on schedule… Maybe with big sails on them? Or big turbofan engines on the roof? The mind boggles from such idiocy. Probably what happens is that wind power from various sources/countries is fed into the Dutch national grid and the rail system claims to have bought enough of it over a long-term period, e.g. a year, to power all its services during that time. In other words, a paper exercise. Another useful idiot speaking out in preparation for the big binge in Paris. They must know that what they are talking about is impossible to achieve. Let’s monitor the success of the elimination (err, “trend”) of carbon gases and New World Order on the basis of gross registered tonnage transports over the oceans, and on nothing else. This is measured global as in “global climate”, anything else does not make Global World Order sense. And, which nation (which shipping company) is the first to sink their carbon/polluter ships because of climate ballyhoo? Click “Live Map” (top menu) and “Density Map” (left menu), navigate like Google map. The irony: From “The Flying Dutchman” (by Wagner) “To rely on wind is to rely on Satan’s Mercy”. The whole thing is of course a con. A trick. An accounting exercise. Otherwise trains would be totally unreliable for transport; even worse than what they are now. Geographic dispersion isn’t good enough to provide reliable winds. vis e.g. Germany. This would make a great cartoon. An electric train with a row of windmills along the track as far as the eye can see. This is the way to mix trains and wind power. Just pave over the rail tracks and turn them into cycle paths. Holland is small and flat after all. Why, the wind is always blowing, while the train is in motion, is it not? Therefore all you have to do is to install the windmill on it.